Restoring Disturbed Landscapes is a hands-on guide for individuals and groups seeking to improve the functional capacity of landscapes. The book presents a five-step, adaptive procedure for restoring landscapes that is supported by proven principles and concepts of ecological science. • indicators for monitoring and how landscape function can be tracked and analyzed as part of a comprehensive monitoring program. 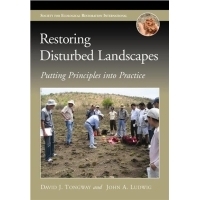 Abundantly illustrated with photos and figures that clearly explain concepts outlined in the book, Restoring Disturbed Landscapes is an engaging and accessible work designed specifically for restoration practitioners with limited training or experience in the field. It tells restorationists where to start, what information they need to acquire, and how to apply this information to their specific situations. Available from Island Press late 2010.